The easiest way of identifying a species of fungi on trees out in the field is by examining the fruiting body. This is generally a reliable method but a small majority of species need further information to be certain. Size, appearance and shape of the fruiting bodies are the key elements of identification, but these can vary for the same species. These factors increase the difficulty of identifying the fungi when inspecting the tree. Norfolk trees staff are all trained in pest and disease diagnosis and can identify fungal fruiting bodies, we also have a very intensive library and can cross reference if unsure. Decay in trees is determined by whether it starts below or above ground. 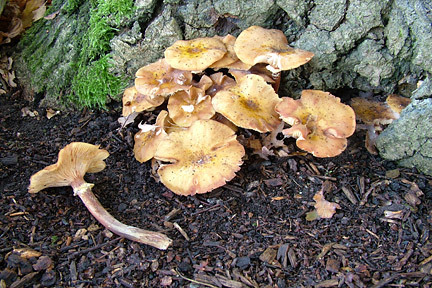 Above ground, fungi fruiting bodies are usually found on stems or branches, often from where the tree has been damaged or where it has started to die back for other reasons. This decay can begin to head downwards towards the roots. Below ground, Decay can start from an individual root to central area’s of the root plate. Once established in the roots, it can head upwards into the buttresses of the tree and up into the crown of the tree. This annual light brown, honey coloured fungus is usually found in cluster’s above the roots around the base of the tree. The diameter of the cap can grow upto 150mm with dark scales. Underneath, there are cream coloured gills and the stem has a ring underneath the cap. Usually forming around Autumn time, but quickly decaying as it has a short life. The impact from Honey fungus on trees is, depending on severity, often fatal. It colonises on the live and dead or dying wood of trees. 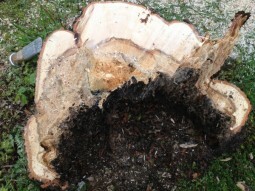 Uprooting or stem fracture failure of the tree can happen before or after the death of the tree. Rhizomorphs are one sign of this fungus in trees, with an appearance of looking like bootlaces or flattened roots with an elasticy texture. This is not an accurate means of identification as a majority of the Armillaria species have them. This fungus is found on a wide variety of coniferous and broadleaved trees. The area affected is the lower section of the tree, generally below 50cm above ground and root system. Mainly found on Beech trees and Silver birch trees but may affect other broadleaved trees. Found to be affecting large branches and stems of the tree. Found growing up to 50cm across with a ‘hoof’ or flatter bracket shape with dark grey to white colour on different varients. This affects the wood of the tree quickly leading to loss of tensile strength which becomes brittle. Some larger trees have enough residual wood to cope with the affects of this fungi to remain standing for a considerable time. This commonly found fungus brings a wide threat from an early stage with White rot developing in the rays of the tree stem, advanced decay starts to affect the lignin, this leaves a spongy mass of white cellulose, initially weakening the tree. Ganoderma can be generally found at the base of the tree (buttress) but also can be found on the stem of the tree and in some cases on majorly affected limbs. 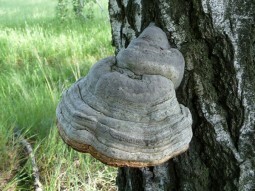 The size of the fungus can measure up to 50cm across by 15cm thick. 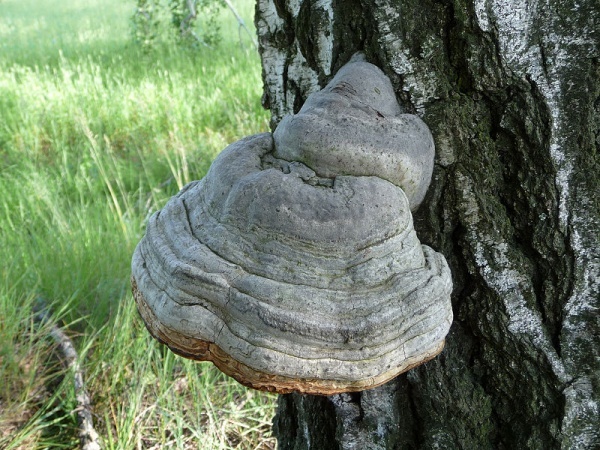 The affects of this fungus to the tree, once advanced and extensive, can result in mechanical failure of the tree by affecting the root plate of the tree. The tree may then have to be felled or dismantled for health and safety reasons. Although the roots become damaged, the decayed wood in the stem still keeps its tensile strength for a considerable time, the host tree usually compensates this affect by growing surrounding wood, keeping the strength of the residual wall acceptable for the tree to tolerate for many more years. This fungus is found mainly on Ash and Plane trees but also on Sycamore, Apple, Sorbus and Walnut trees. Found on the main trunk of the tree or the affected stems. 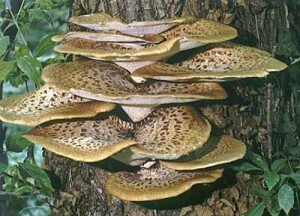 depending on the host species, this fungus can cause white-rot which breaks down the lignin and cellulose of the tree leading to brittle wood. This fungus starts forming around summer or early autumn time. Dead brackets can remain attached for a few months before falling of the tree and even stay intact for several more months whilst on the ground. Once the host tree has become affected, depending on species of host, it can have limbs snap or break out of the tree. Some more resilient tree host species can keep strength in the residual wood. Found on a range of broadleaved trees, but mostly on Beech, Maples and Lime trees on the lower buttresses and roots. In the early stages of the decay on trees ‘soft rot’ is found to affect the cellulose layers of the secondary walls, leading to the tree becoming brittle. In later stages white-rot can develop leading to further affects on the tree. 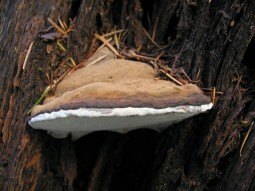 Black, charcoal-like crust which has many small fruit bodies, turning into dust from being crushed by finger and thumb, this has a greyish asexual fruiting body on top. Reaching upto 50cm accross, but still hard to locate as being so close to the ground and hidden between the buttresses. The grey fruiting body forms in spring/early summer. 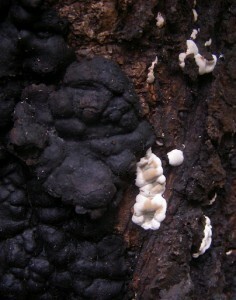 The black crusts form only in the first year, but can persist on the fungi for many more years. The soft-rot can lead to brittle failure in the tree. There are usually no warning signs showing bulging or cracking which often occur with white rot in trees. This tree fungi is found mostly on Beech trees in the UK but sometimes on other broadleaved trees and not very often on conifers. It affects the main root structure or the trees making them brittle and liable to fracture both along and across the grain of the tree. The fungi has many layers varying in size from about 100-200mm across, which grow from a fungal mass. This fungal mass is the area which is usually connected to the tree by either sitting in the trees buttresses or sometimes on top of the soil which is above the roots, this can be found up to several meters aways from the tree. This fungi Can be found growing upto to the size of 1 meter across in the correct conditions. 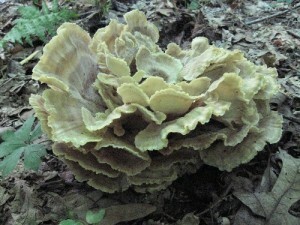 You can gently squeeze this fungi on the underneath and after 15-20 minutes it should come up with a bruising affect. This is another sign to tell whether it is a correct identification. When looking for signs without the fungi being there isnt too easy. The crown isnt a reliable source of whether to find it as many trees with this fungi have had a full dense foliage in the crown and still have uprooted, while some have die standing. Its also hard to tell of the condition of the trees roots as sometimes the fungi is confined to the deeper root system. Besides all this, trees can stand rather stable if the fungus is just in the central wood. 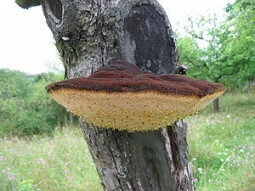 This fungus is commonly found on Broadleaved trees, mostly on Sycamore, Horse chestnut, Lime and Beech trees. Affecting the main stem of the tree and some branches it decays with a white-rot on the sapwood, creating brittle wood. Appears annually in April – December but mostly in late summer and decomposing quickly. Its appearance is a soft fleshy, fan shaped bracket with a light brown upper surface with dark brown scales coating the top and the underneath has a creamy-white colour. The decay on the tree is in some cases restricted to a small area associated to a wound already on the tree. Extensive decay and stem fracture on trees can be caused by the fungi spreading into areas of multiple or massive wounding. Please note that this section on Pest & Disease Diagnosis is in progress of being updated and added to. Norfolk Trees was established in 2002 by Ashley Barnes, we operate throughout Norfolk and East Anglia. Our tree surgeons are all fully qualified for the work which they undertake and have over years experience in all aspects of tree care, which include dismantling, felling, crown lifting and reductions, dead wood removal, formative pruning, tree surveys to BS5837, tree hazard reports, pest and disease diagnosis, bat inspections, stump grinding or treating and tree planting. Our staff allow clients to be confident and assured of the quality of our work and a £10,000,000 public liability insurance offers peace of mind. All work is carried out to BS3998 2010. In addition to domestic work we undertake commercial work for Local Authorities, Parish Councils and contract to the Borough Council of Kings Lynn and West Norfolk, Breckland Council and Serco, South Norfolk Council, Broadland Council, NCC Highways, KierMG and Anglian Water along with numerous other clients. Contractors Health & Safety Assessment Scheme.